In the insurance industry, a lawsuit by one employee against another is called a fellow employee (or co-employee) suit. This article will explain how state laws affect employees' ability to sue one another. It will also explain whether fellow employee suits are covered under general liability and commercial auto policies. Imagine the following scenario. You own a popular restaurant in Happyville. It's noon on a Friday, and your waiters are rushing to serve your lunchtime customers. Jill, one of your servers, is heading to the dining room with a fresh pot of coffee when she accidentally clips Beth, another server, with her elbow. The coffee pot flies out of Jill's hand, and hot coffee spills down Beth's right leg. Beth sustains extensive second-degree burns that require hospitalization. Beth collects benefits under your worker's compensation policy. She also considers filing a lawsuit against Jill. Beth believes that Jill mishandled the coffee pot and that her negligence caused the accident that resulted in Beth's injury. Can Beth sue Jill for a work-related injury? The answer is likely no. Most states have enacted exclusive remedy laws that prohibit employees from suing other employees for work-related injuries. These laws require employees to rely on workers compensation benefits as their exclusive remedy (sole source of compensation) for an injury sustained on the job. Exclusive remedy laws are primarily intended to protect employers from lawsuits by injured employees. Employers that fulfill their obligation to purchase workers compensation coverage are largely exempt from employee suits. However, the laws protect employees as well. If exclusive remedy laws did not exist, injured workers could "double dip." That is, they could obtain workers compensation benefits and damages against an employer or fellow employee for a single injury. While most employee-versus-employee suits are barred by workers compensation laws, there are some exceptions. Supervisors and Officers: A few states allow injured employees to sue supervisors or executive officers under certain circumstances. 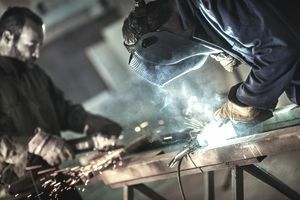 To file a lawsuit, the injured worker must show that the supervisor owed the worker a personal duty of care and that he or she breached that duty. The worker must also prove that the breach of duty was the primary cause of his or her injury. For example, Bob is employed as a machinist by Marvelous Manufacturing. Bob notifies his supervisor (Jeff) that the safety guard on a piece of equipment is malfunctioning. Jeff tells Bob to use the equipment anyway. Bob is later injured while using the equipment. Bob files a suit against Jeff for bodily injury. Bob contends that Jeff was negligent because he was aware of the workplace hazard but failed to take any action to protect Bob. In the states that permit fellow employee suits, Bob might be permitted to sue Jeff. States generally bar suits by employees alleging that the supervisor negligently failed to provide a safe workplace. The duty to provide a safe workplace falls on the employer, and it cannot be delegated to an employee (including a supervisor). Motor Vehicle Accidents: Some states permit suits between employees when one employee has been injured in a motor vehicle accident caused by another employee's negligence. For example, suppose that Sandy and Sue are employees of Ace Accounting. One day, Sandy and Sue are heading to a client's office in a car owned by their employer. Sandy is driving, and Sue is her passenger. Sandy is speeding around a curve when she loses control of the vehicle. The car hits a tree, and Sue is injured. Sue collects benefits from her employer's workers compensation policy and then files a lawsuit against Sandy. Most general liability policies contain a "co-employee (fellow employee) exclusion". This exclusion appears in the section entitled Who Is An Insured. It states that no employee is an insured with regard to bodily injury or personal and advertising injury to a co-employee if the latter is injured in the course of his or her employment. In other words, Employee A is not an insured if he or she is sued by Employee B for bodily injury or personal and advertising injury that Employee B sustained on the job. In the previous example, Bob has been injured due to the negligence of his supervisor. Assume that the injury occurred in a state that permits suits between employees. As an employee of Marvelous Manufacturing, Jeff is an insured under Marvelous' general liability policy. Because of the co-employee exclusion, however, Jeff is not covered for Bob's suit. As noted above, some states permit employees to sue other employees for injuries sustained in auto accidents. Employee drivers may have no coverage for such suits under their employer's commercial auto policy. Most commercial auto policies contain a "fellow employee exclusion" similar to the one found in general liability policies. In auto policies, this exclusion appears in the Exclusions section under auto liability coverage. It eliminates coverage for bodily injury sustained on the job by any fellow employee of an insured worker. Coverage for fellow employee suits is important if your state permits such suits. Some insurers will remove the fellow employee exclusions in the general liability and commercial auto policies for a small additional premium. This change is usually accomplished via an endorsement. Incidental Medical Malpractice: What Is It?